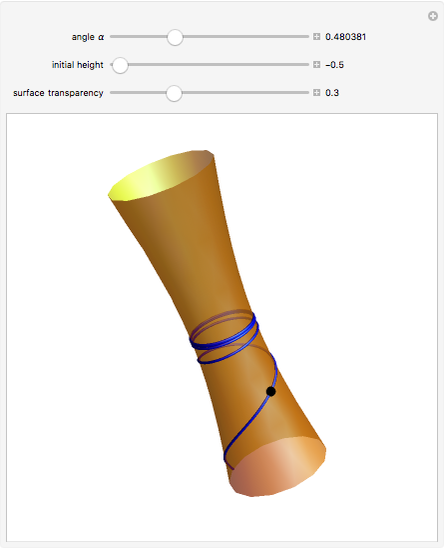 The image shows a one-sheeted hyperboloid symmetric around the axis. The blue curve is the unique hyperboloid geodesic passing through the given point (shown in black) and intersecting the parallel (i.e. the circle of latitude) through that point at the given angle . When is small enough, the geodesic stays in the lower half of the hyperboloid. When is equal to a certain critical value, the geodesic approaches the circle (i.e. the parallel with the smallest radius) but never reaches it. This critical value is stored as a bookmark (click the "+" button in the upper-right corner). For still higher values of , the geodesic crosses the circle and proceeds to the upper half of the hyperboloid. The geodesics are obtained by numerically solving the geodesic differential equations (a pair of second-order nonlinear equations). The critical value of can be calculated using Clairaut's relation, which states that the product remains constant along a geodesic (where denotes the radius of the parallel passing through a point on the geodesic and is the angle between the parallel and the geodesic at that point). Assuming that the initial value is , we see that the geodesic can never cross a circle with radius . Making the surface semitransparent gives a better overview of the geodesic behavior, but decreases the visualization performance.